U.S. President Donald Trump and Harley-Davidson got into a war of words after the iconic American motorcycle manufacturer threatened to move a significant portion of its production facilities overseas after retaliatory tariffs from the European Union. The retaliatory tariffs by the EU came after the Trump administration imposed duties on European steel and aluminum. The EU’s tariffs would in turn affect more than $3 billion of U.S. goods, including bourbon, yachts and motorcycles. In a statement, Harley-Davidson said on Monday that it would curb costs by moving its production facilities overseas in order “to address the substantial cost of this tariff burden long-term.” Harley-Davidson already has plans in place to build a production facility in Thailand, which will allow it to avoid the country’s tariff of up to 60 percent on imported motorcycles. President Trump responded on Tuesday, saying that Harley-Davidson quit and will be “taxed like never before” via Twitter. 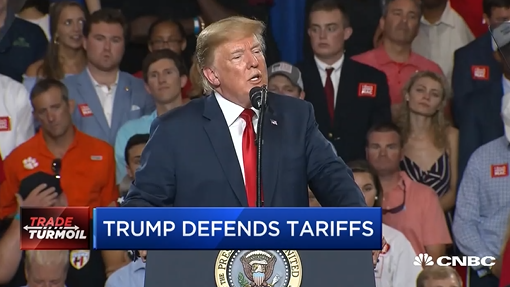 It’s one of the first major responses by a U.S. company to the tariff-for-tariff battle going on between the United States, China and the EU. Meanwhile, Harley-Davidson’s stock (NYSE: HOG) continues its decline today with a 0.96% drop and is down about 21% year-to-date. ETFs with Harley-Davidson exposure haven’t reacted much today with First Trust NASDAQ Global Auto ETF (NASDAQ: CARZ) up slightly at 0.12 and First Trust Nasdaq Transportation ETF (NASDAQ: FTXR) is unchanged.